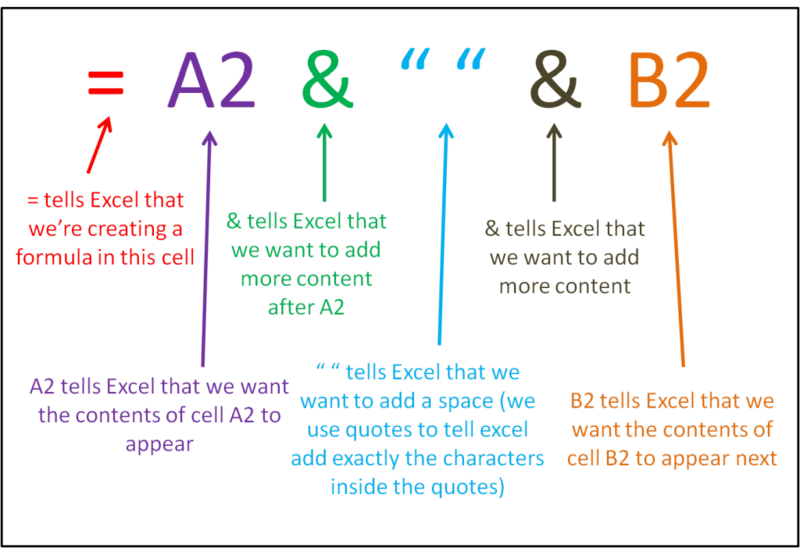 In a previous post we showed you how to separate first and last names into two columns using Excel’s text to columns function. 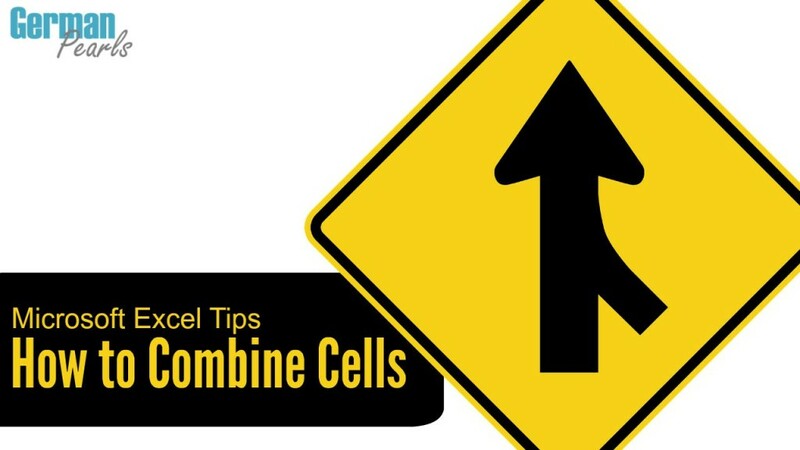 But, what if you want to combine cells? Say you have first and last names in two columns and you really want them together in one? 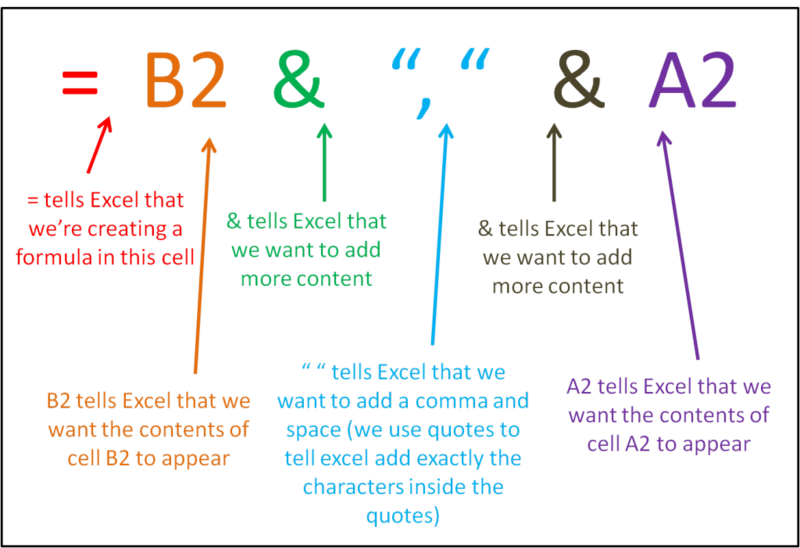 Here we’ll show you how to join (or concatenate) multiple cells into one. 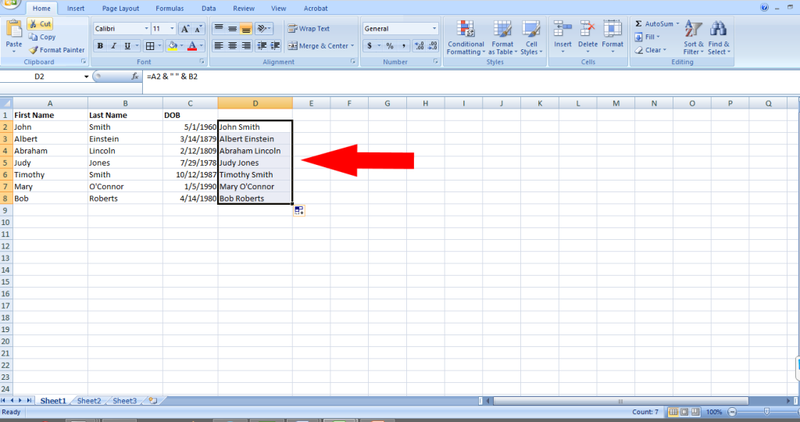 So, if we have an excel spreadsheet with one cell containing the word “John” and another containing the word “Smith” we could concatenate the two and create a cell containing the text “John Smith”. Since this is the result we’re looking for, we now want to copy this formula into rows 3 through 8 (or cells D3 through D8). We can do this in a few ways. 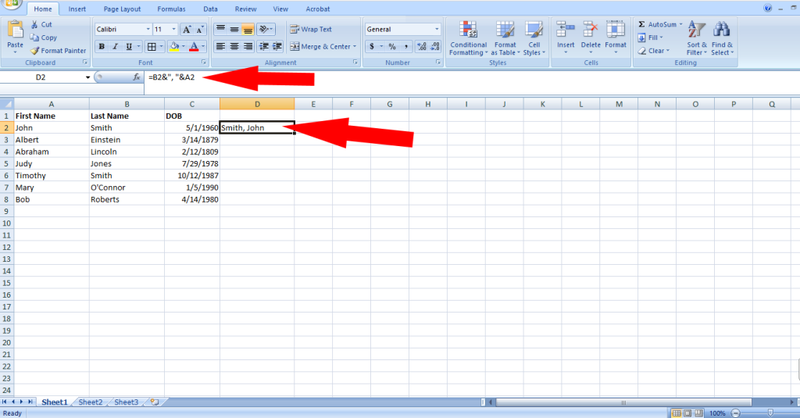 The other way is to use a built in function of excel’s to copy a cell across a row or down a column. 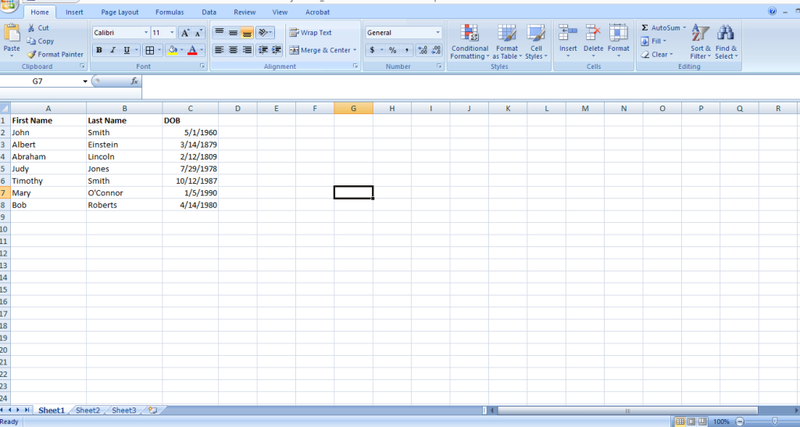 To do this, select cell D2. 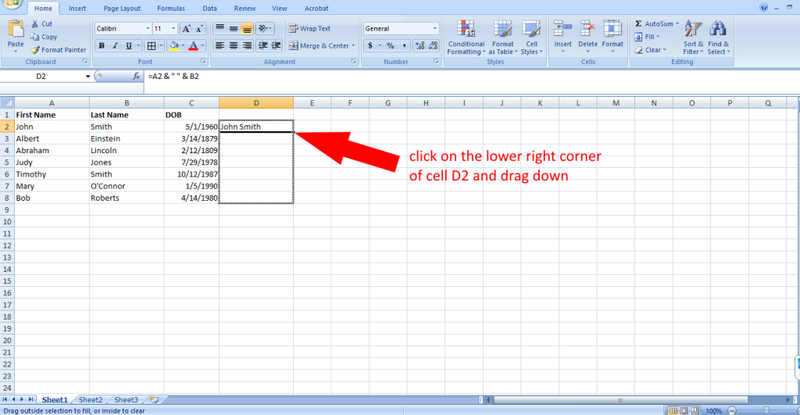 Then, place your mouse cursor over the bottom right corner of the D2 cell and your mouse cursor should turn into a plus sign. When you see the plus sign, press your mouse button down and hold it while dragging the cursor down the column. You’ll see cells highlight as you drag down. When you see D3 through D8 highlighted, let go. 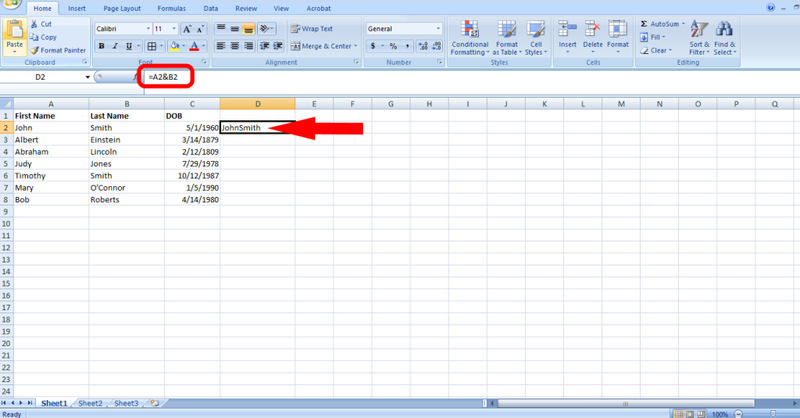 Excel will automatically copy the column to the other cells you’ve highlighted. 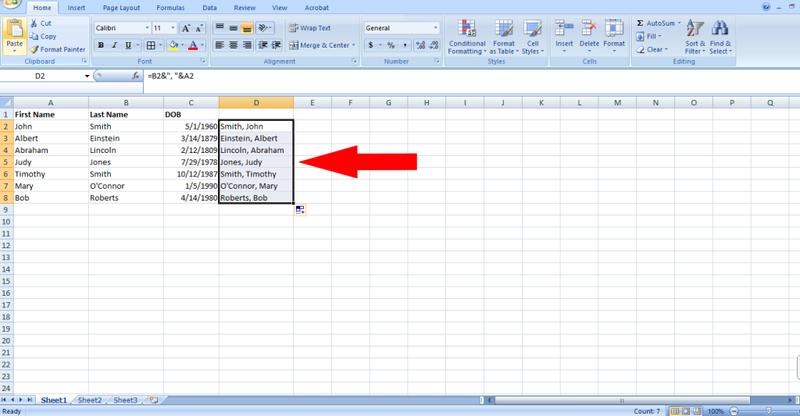 Let’s say we start with the same spreadsheet but, instead of creating a column that says John Smith, we want to create a column that says: “Smith, John”. 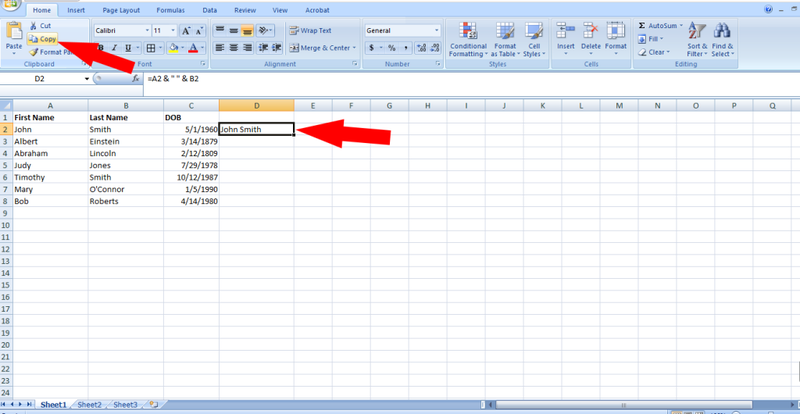 Always start the formula with an equal sign (=) to tell excel that you’re typing a formula. 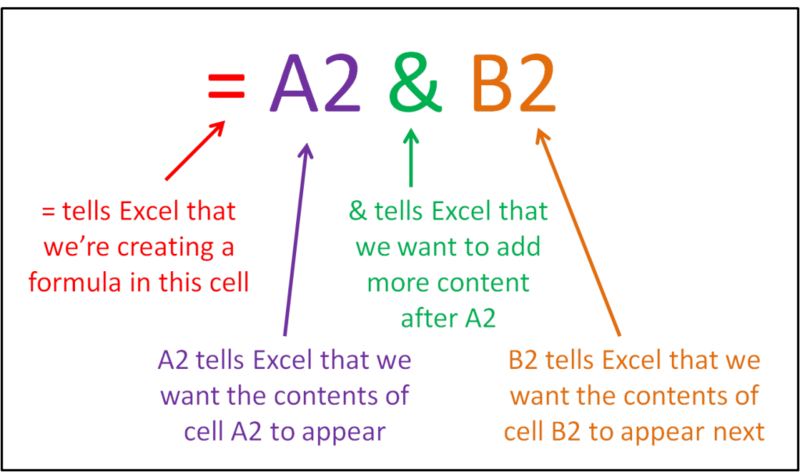 Add an ampersand (&) to tell excel you want to add more to the cell after what was added in step 2. Add more content by repeating step 2. Concatenation can be used in many ways. If you have problems getting it to work or need help, leave a comment below. We’d love to help out. You don’t need to use the ampersand in the formula. You can simply use commas instead. Good tip, I didn’t know that, thanks Damien! Thank you for sharing with us! I didn’t know about the formula. 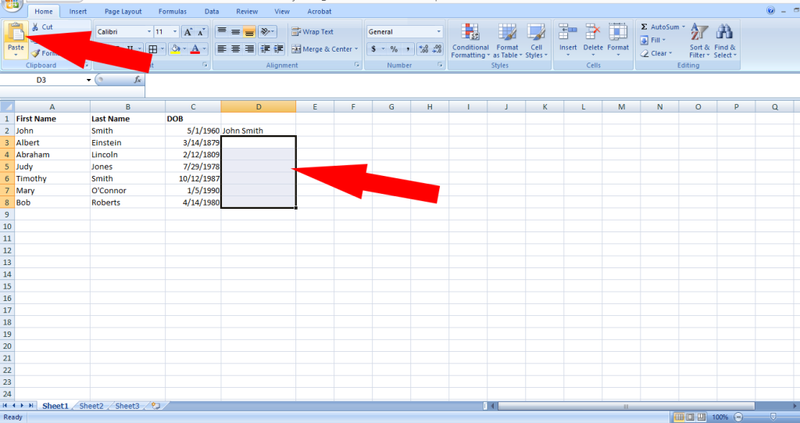 Surely, your post will help reader to get the full fledge information about the combining the cell in Microsoft excel. keep on sharing.. I hope the formula is useful to you someday.